You earned your guatusa massage today. This morning, a quick coffee and muffin replaced the traditional baleadas (folded tortillas stuffed with refried bean and scrambled eggs) that you’ve eaten for breakfast the last few days. You wanted to complete the Loop Trail before the midday heat and the late-afternoon showers arrived. So you set out on the three-hour hike before most of the other guests at the lodge were even awake. The path started just beyond the lodge’s lush gardens. You quickly found yourself deep within the tropical wilderness surrounded by colorful birds and their cheerful songs. The Toucan Tower, an observation platform, was your first stop. It gave you a bird’s-eye view of the forest’s canopy and your first sighting of a lovely cotinga. The rare, electric blue bird, whose feathers the Aztecs and the Mayans gifted to their leaders, can usually be seen in this area. Lots of uneven steps followed. You detoured to Las Pilas, a small swimming hole, but decided to wait until later in the trek for a swim. You followed the ridge that divides the Corinto and Coloradito Rivers. Kinkajous, peccaries, and monkeys were spotted along the way. Then you carefully watched your footing down steep switchbacks and over fallen trees to Mermaid Falls, where cool water pooled after tumbling over the rocks. It was a refreshing break before the last leg of the hike. The Loop Trail is in Pico Bonito National Park. Beautiful Peak, in the Cordillera Nombre de Dios mountain range, is the backdrop to La Ceiba on the coast of the Caribbean Sea. Honduras’ third-largest city, named after a giant tree that once grew by the dock, is known as the eco-tourism capital of this Central American country. Ferries depart for the Bay Islands (Roatán and Útila). Cuero y Salado is a wildlife refuge that’s home to endangered West Indian manatees. Plus the Cangrejal River offers the best whitewater rafting between North and South America. The edge of the national park is also where you found the Lodge & Spa at Pico Bonito. 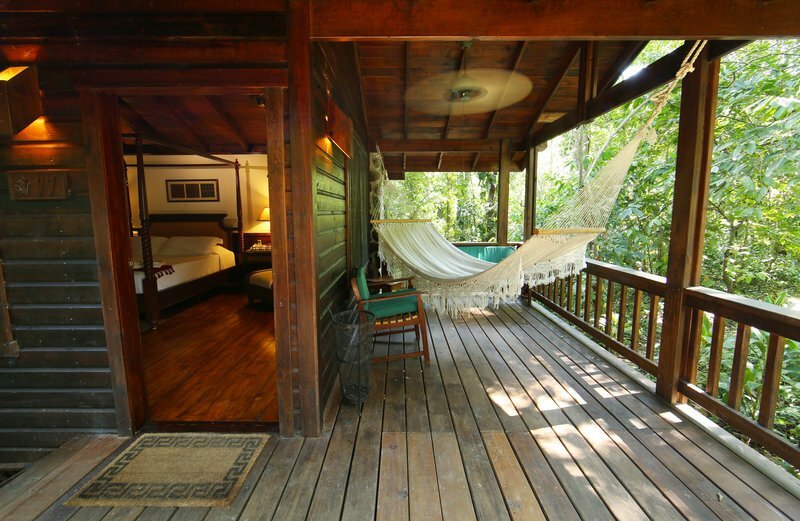 The eco-luxury lodge sits southwest of the city amidst 400 acres of undisturbed rainforest. Its main lodge is home to Itzama, the screened dining room, and a wraparound deck dotted with rocking chairs. Sturdy paths, built to protect the fragile landscape, lead to wooden cabins. They’re rustic retreats with louvered windows, ceiling fans, and wide hammocks. Another path takes to you the peaceful spa. Its small pool and circular treatment rooms, made of stone and thatch, are hidden in the jungle. All you can hear is the sound of water flowing downstream and a frog-like croaking, which turns out to be keel-billed toucans. It’s the perfect spot to relax after your hike. All you need is a cool drink and that guatusa massage—specifically meant for tired legs—and you’ll be ready for your next adventure tomorrow. You might go to the Butterfly Farm to see blue morphos or snorkeling in the remote Cayos Cochinos. After your baleadas for breakfast, of course.